Pictures of the Taekwon Do class with GrandMaster Gillman. Click the above picture for more pictures. Thank you for visiting the main website for Kim’s Taekwon Do of Hawaii. From here, you can learn about Taekwon Do in general and the philosophy of our federation in particular, and you can find details about each of our schools and instructors. Please let us know if you have any questions. You can also come watch a class anytime, and talk face to face with one of our instructors. We hope to see you in class soon. Mahalo! Kim's Tae Kwon Do at UH Manoa is currently an Registered Independent Student Organization at the University of Hawaii. 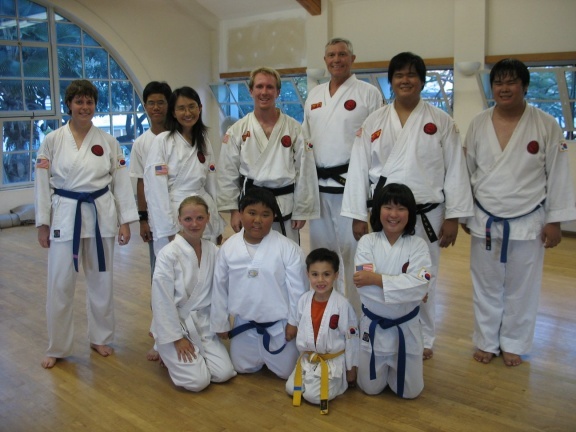 Kim's Tae Kwon Do at Ewa Beach is located at Ewa Beach Community Park. Copyright ï½© 2005 Kim's Tae Kwon Do. All rights reserved.